The Bushsports Adventure Team have trained extensively to supply your team exceptional facilitated team building activities. Delivering professional quality adventures to staff and corporate groups in Sydney to Brisbane and The Gold Coast. We are an adventure training company that harnesses effective team building solutions. With a great range of quality outdoor experiences and fun games that deliver on the outcomes. Since being established in 1972 we continue to bring the best activities for groups. We start with a detailed itinerary, defined by outstanding services. Our approach is to actively listen, discuss and offer unique and adventurous solutions to inspire your business teams. From Sydney’s best indoor and outdoor team building experiences. Which can entail abseiling off buildings on Cockatoo Island to Amazing Races throughout The Whitsundays and along the Gold Coast from Surfers Paradise to Kingscliff. We love to challenge and reward your team everywhere! 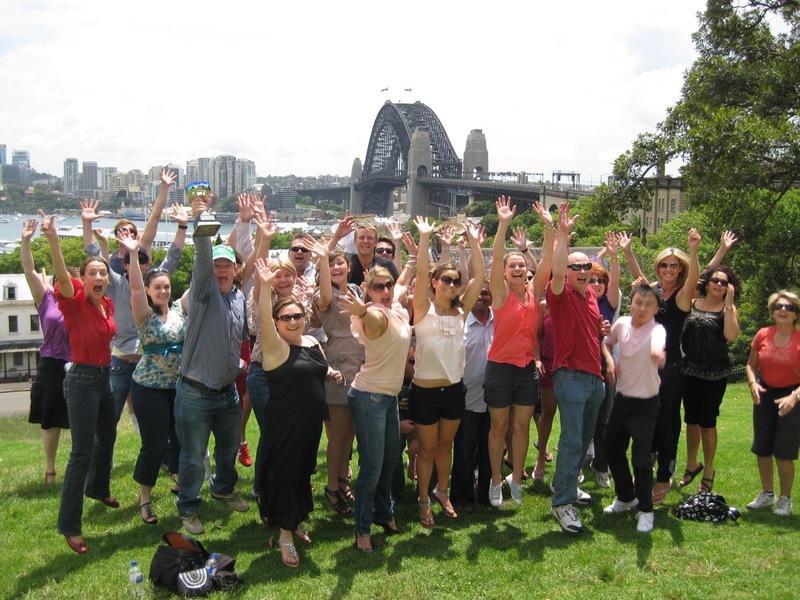 Premier Sydney Team building programs and Sensational Brisbane Team Building Events. Enthralling Blue Mountains Adventure Experiences. All designed to enhance communication and commitment within your company. The activities and games are tailored to match specific business goals of Project Planning, Integration, Communication, Collaboration, Developing trust and gather cohesion. Or select adventure activities to fire up the adrenaline. Facilitated insight, supporting and helping companies develop cultural change through strategy development, staff training, innovative thinking, investing in and rewarding staff. If your team is need of a change from boring teamwork to more exciting activities. Bushsports will stretch the comfort zone and create your team next unique experience. We have a team of dedicated and professional staff are qualified to ensure your events are delivered timely and professionally. Providing excellent quality, professionally run, fun, motivational team bonding, team building and conference activities. For 10-1,000 participant delegates. Incorporating leadership development, group activities and exceptional corporate events. With a focus on developing, strengthening, energising and inspiring groups to laugh and enjoy active participation. Fun in Sydney City CBD, Sydney Harbour, Darling Harbour, The Rocks. Sydney Olympic Park, Manly, Coogee Beaches. Out to the Blue Mountains, Hunter Valley, Central Coast, South Coast, Southern Highlands. Down through Melbourne and out along The Great Ocean Road. Conference Centers and Venues throughout Sydney, including: The Sebel, Peppers Resorts, Novotel, Pullman, Stamfords. Unique Venue locations within Tropical North Queensland, Cairns, Brisbane, Sydney, Canberra and Melbourne. Our team matches exceptional conference incentives and business rewards. Professional facilitators and guides to team building success. Proven professional team building facilitation services – from enquiry to evaluation. Creating innovative customised team-building activities for all abilities, skills and locations in Australia. Indoor conference ice breakers to exhilarating outdoor corporate adventure challenges and team experiences. Ideal for teams and groups, from 10 to 500 participants. Focus on team-work, team-spirit and building team-morale. Incentives, Rewards, Team Events, Corporate Training, Leadership, Graduate and team Development programs. Team bonding activities that add spice, flavour, imagination, excitement, with plenty of social interaction. Blending team building adventure activities with the unique tastes of the region; Sydney, Southern Highlands, Blue Mountains, Hunter Valley and Central Coast. Melbourne, Docklands, Great Ocean Road…. Hands on learning experience, brief – activity – debrief sequence. Implementing 7 P’s – Prior Planning & Preparation Produces Positive Powerful Performance. Utilisation of SWOT analysis & SMART Specific, Measurable, Achievable, Realistic in a Timely framework. Backed with a terrific FISH principle, the right team attitude. Fun, YES! Enthusiasm and energising teams of people to enjoy healthy, fun active team building programs. Fully mobile team building to all Australian conference centres, meeting venues, resorts, hotels, beaches and reserves. Simply great fun team enjoyment, training and reward! “A big thank you to you all for a most enjoyable, hassle free day on Friday! Having your expertise there meant that even I could enjoy myself! I’ve never had so much praise and well wishes after organising an event. You are obviously a very well organised, experienced company and deserve all the praise that I am getting! We will definitely be using the Bushsports Sydney team for future events with KPMG. Speak with a Bushsports representative to develop your next Corporate Group Event. Experience the fun side of Bushsports Adventure Team Building events in Sydney. Ideal for PA’s and EA’s looking for special events and team building for their teams. Dynamic Games and activities for group functions with Laugh a Minute to Win it, Trivi-Action or Fun n Games. Enjoyable rewarding experiences. Improving corporate culture with large scale events in Sydney. Leadership Training, Induction and Graduate training programs. Integration of new staff and employees. Creating fun team dynamics as well as new Graduate & Employee Retention programs. Sydney’s brilliant fun activity for all groups. ‘Go and play with these guys at the helm for a real Amazing time in Sydney’. Amazing Races take in iconic Sydney locations such as historic Pubs in The Rocks, Cockatoo Island, Luna Park and Darling Harbour. Mix n Match a series of 5 fun Challenges with Cerebral Activities and creative Masterpieces. Transport options includeracing around Sydney in Harbour Jet Boats, Cycling The Harbour Bridge. Jumping aboard historic Tall Ships, Water Taxis, Taxis, Trains or Ferries. As part of the program we improve your Teams communication skills, planning, strategy and competitive team work in a race against the clock. If Amazing Races in Australia are too competitive or physically intensive. Enjoy the relaxed pace of a treasure hunt throughout Sydney’s historic quarter, The Rocks. Embark on a journey in search of real hidden treasure. Teams work together unlocking clues, deciphering messages and overcoming a variety of fun challenges. Ideal for large corporate group incentives which are excellent fun for everyone mixing it up with mischief and mayhem.